When Harold first met Percy he stated that railways were "slow and out-of-date", but was proven wrong when Percy later beat him in a race. 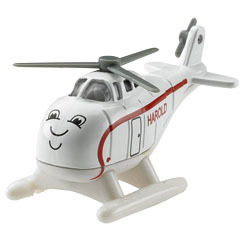 Harold is owned by the coastguard on Sodor and lives at Dryaw airfield by Thomas' Branch Line. He keeps a watchful eye over Sodor in case of trouble, and speeds to the rescue of anyone in distress. As of Misty Island Rescue, he has joined the Sodor Search and Rescue team and lives in his own shed at the Rescue Centre.